Home Uncategorized Could You Get A Job 100 Years Ago in Cincinnati? Could You Get A Job 100 Years Ago in Cincinnati? Imagine you got sucked into a cosmic vortex today and somehow landed in Cincinnati 100 years ago. How would you earn your keep? There is a good chance you would end up unemployed and unemployable because it’s a fair bet that you lack the skills sought by employers in 1916. You are probably unprepared for work as a japanner, bristle-comber, hair-spinner, huckster, vamper, laster, core-maker, street sprinkler or feather-curler. The 1916 Cincinnati city directory, for example, listed more than 30 men employed as japanners and three companies specializing in japanning. Today, this technique—in which layers of baked paint and shellac are made to simulate Asian lacquer—is an arcane art practiced by a small number of hobbyists. One hundred years ago, you might find japanners working in the same shop as varnishers, veneerers, finishers, polishers, and gilders as they decorated furniture, appliances, and household items. The skills required by a good bristle comber are nearly extinct today, yet, in 1916, Cincinnati companies regularly advertised for men who straightened and sorted animal hair and bristles for assembling brushes. There was, at one time, a bristle-combers union active in Cincinnati. Somewhat related to bristle-combers were hair-spinners. The hair-spinners also sorted and processed animal hair—mostly from horses and hogs—but prepared it for stuffing furniture and bedding. Horse hair often stuffed household furniture. Hog hair stuffed cheap bedding and carriage seats. We still have hucksters in Cincinnati, but we don’t call them by that name anymore. In 1916, a huckster was a completely reputable line of work, and men listed that as their profession in the census, in the city directory, and in the newspaper. A huckster was a salesman, usually of the door-to-door variety, most often pushing a cart, but commonly based in a market stall or even in a small shop. Some of 1916’s better occupations disappeared as the workplace evolved. As a thriving manufacturing center, Cincinnati was home to many core-makers, folders, molders, pattern-makers, trimmers, vise-hands, oilers, and craters. Almost all of these functions are automated or digitized these days—even craters, who had nothing to do with the moon. A “crater” was someone who crated the finished products for shipping. Public services also changed with the times. The city of Cincinnati employed pavers and street sprinklers, two jobs made obsolete when the city began blacktopping instead of paving our thoroughfares with bricks and granite cobblestones. The introduction of vehicles powered by internal combustion engines spelled the death of entire rosters of Cincinnati occupations, including carriage-builders, draymen, farriers, whip-makers, stablemen, harness-makers, carters, teamsters, grooms, liverymen, horseshoers, saddlers, and hackmen. The wealthier homes in Cincinnati had their complement of domestic help, including maids, butlers, cooks, and governesses, but also positions we hear little about today—even on period dramas like Downton Abbey. Who, today, hires scrub girls or pantry girls? How many houses maintain laundresses or nursemaids? As technology turned the icebox into the refrigerator, we lost the regular visits of the iceman. It took a surprisingly long time for the trade to die out—Cincinnatians could still arrange home delivery of block ice into the 1950s. 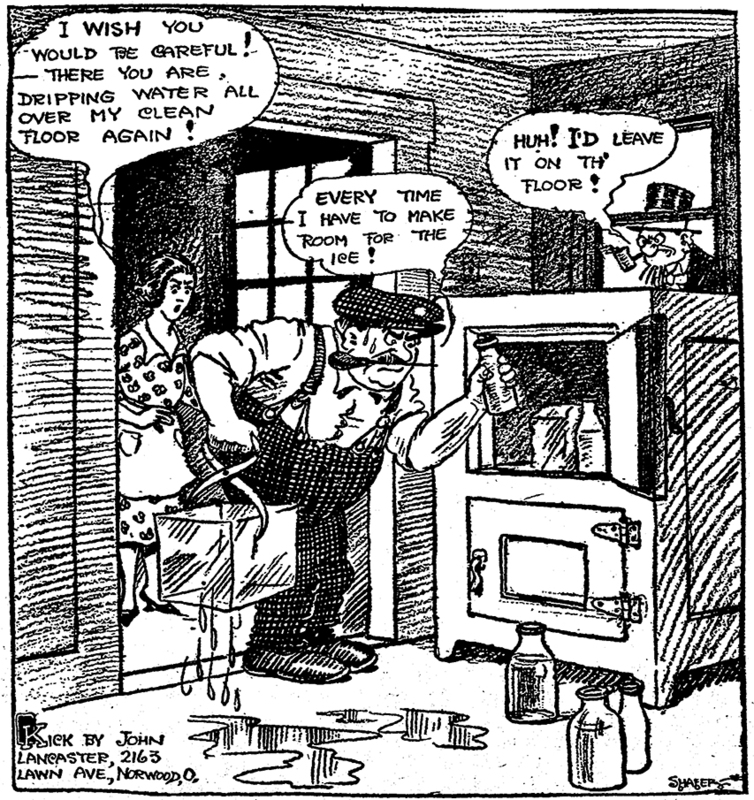 Most urban Americans got regular calls from the iceman in 1916. He lugged a big block of ice for their ice boxes. Home ice deliveries continued in Cincinnati until the early 1950s. Fashion kills occupations just as well as technology. Don’t confuse a feather curler with a hair spinner. Feather curlers took exotic feathers and shaped them into fashionable arrays for ladies’ hats. In doing so, feather curlers worked side-by-side with milliners, another occupation that has fallen into scarcity. There has not been much demand for collar-makers, either, after men’s shirt styles shifted to button-down broadcloth. Today, though, you’ll still find more milliners than corsetieres, a woman’s occupation that, even in 1916, was fairly exclusive. A corsetiere, of course, made and fitted corsets. The clothing stores catering to women advertised their corsetieres in 1916 by name, and all their names implied access to the highest reaches of respectable society (and the more French, the better). Cincinnati dames could visit Mrs. Titus or Miss Gallagher or Mrs. Adelle Mahone at Rollman’s, or Miss Sadie Hyman, who ran her own shop on Race Street, or Madame Stebbens at Shillito’s, or Madame Husband at the Fair Company. 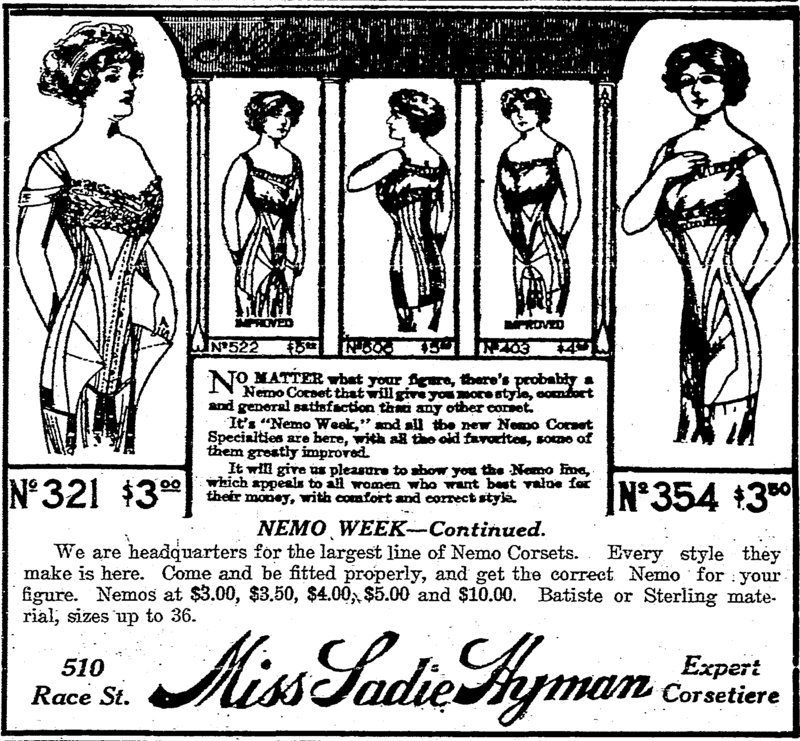 No wonder Miss Sadie Hyman provided such solicitous service to her clientele. Those $3 to $10 corsets would cost $75 to $250 in today’s dollars. Some occupations have revived after time. With the rebirth of craft brewing, Cincinnati will likely see more maltsters, long after Prohibition decimated their number. Beer barrels today, though, are predominantly metallic, so we have fewer coopers, and they are now confined to distilleries. And, alas, we are unlikely to see any more professional bill posters and traveling circus agents.